This is a sub section of Early and school days which was split as follows. When we moved from Edinburgh we stayed in a rented downstairs flat in a house in Kirk Brae in Cults - Cults is just a few miles up the Dee from Aberdeen. This was a tempory move for several months until something could be found in Aberdeen where my father worked. I do remember going to Cults primary and enjoying the atmosphere of a country school. Unfortunately the school is long gone, and so I do not have a photograph. I remember the children from outlying areas came to school in a taxi - I guess this was more economical for the local authority than a school bus. Unfortunately I cannot remember the names of any class mates - I will need to see what I can find on Friends Reunited to see if that jogs any sleeping memory cells. 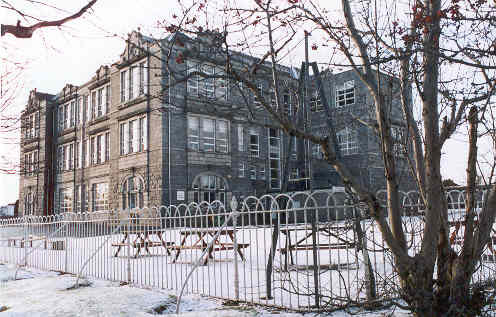 This is a picture of Broomhill Primary which I took in 2003. It hasn't changed all that much on the outside but we did not have any playground furniture in the fifties. We started off in Holburn street in Aberdeen in a three room basement flat in a tenement. School was a short walk away along Balmoral Terrace, and up Gray Street. The girls had their own playground. Sport was the occasional march up the road to the schools' playing fields at Harlaw. 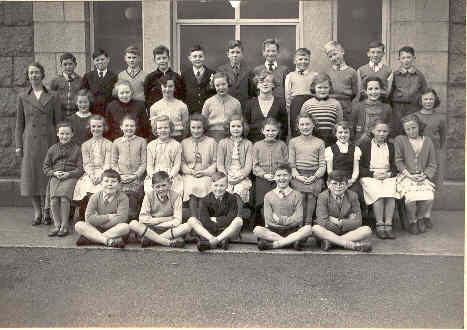 This is a class photo at Broomhill in 1955. I am on the front row, extreme left. The teacher was the excellent Miss Robertson - a highly respected teacher of the old school who was also a good pianist, who went on cruises of the Norwegian Fyords and loved Greig. I am older now so memories are quite strong, and I remember all of the names of the boys in the photo most of whom were good chums, but strangely I can hardly remember any of the girls names. Working along from me there is Alistair Gunn, Harold Fowley, Bruce Paterson, and John Wright, and in the back row amongst others are chums Malcolm, Iain, John and Jack. .
We got a good rounded education at Broolhill from Miss Robertson and earlier Miss Forbes. I did reasonably well and had a good singing voice . We learned Scottish Country dancing downstairs in the gym, and the boys took it in turns to fetch in the school milk crates. The crates were freezing cold in winter, sometimes sharp, and dug into your hands but gloves were for softies. 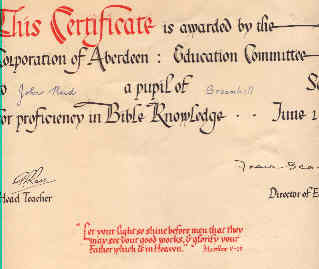 Anyone who knows me now will find the opposite certificate a strange one for me - it was won for excellence in bible study. This certificate is perhaps less strange. I was good at essays and loved reading - poems, books, anything. 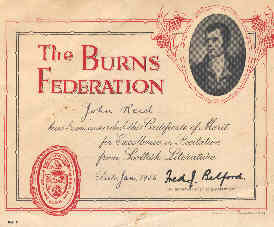 Anyway as a Scot I am proud to have won a certificate on Burns, our national poet. The Burns memory cells were revisited in late 2003 when I visited Kirsty's local in St Andrews. It is called Drouthy Neighbours, has Souter Johnnie's seat, and Meg races across the ceiling towards the safety of a bridge over flowing water. Who recognises the theme - Tam o' Shanter? Unfortunatley all these were lost on Kirsty - but I did later send her a photocopy of the epic poem. What else do I remember about Broomhill? Well I remember listening to the schools music programmes on the radio with "Blow the Wind Southerly" by Joan Sutherland, and then we would all sing along too. I remember the student teachers and the problems we posed them - but not when their examiner was there. I remember the school sweet shop opposite the school. I remember that I was at Broomhill when the first Yo-Yo chocolate biscuit was launched. And I remember playtime when we had sword fights as Highlanders against the English, or collecting cigarette cards. We played a game to win more taking it in turns to hold the card at right angles to the wall of the bicycle shed, and then letting it flutter to the ground. If it landed on another card, you got to keep all the cards on the ground. And then of course looking back I am impressed by the way the games we played followed a seasonal pattern. How did we all know simultaneously that it was time to put away the cards and get the marbles out - conker time was easier to explain. I remember three of us each buying a different comic - one bought the Topper, another the Beano, and the third the Eagle. Then we would swap and swap again and then get our original comic back again. It was Ian McKenzie who bought the Eagle, so it was only fair he got it back again with its prized middle page. Any fee gifts with the comics were not circulated. We were friends, but not stupid. These were the golden days of childhood that we all cherish - when summer holidays seemed so long but went by so quickly. With family picnics up Deeside at the weekend. Going to the pictures twice a week, ice skating on Saturday afternoons - and going down the beach (which we still do). And so you had started primary as a tiny child, and then it was time to leave as a "big boy" - and repeat the cycle with the trauma of friends being scattered and having to start again as a stranger at secondary school, back again to being a tiny. Early days Broomhill Primary School Ruthrieston Secondary Robert Gordon's College.